Although debt collection plays an important role in how credit markets function, it can also expose American households to unnecessary abuses, harassment, and other illegal conduct. Unscrupulous debt collectors sometimes use incorrect data and illegal collection tactics to file lawsuits or pressure consumers into making payments on debt they may not owe. Even worse, millions of consumers become aware of lawsuits having been filed against them only after courts have reached judgments on cases frequently based on inaccurate information. Communities of color as well as low and middle-income communities are hit much harder by these collection lawsuits. 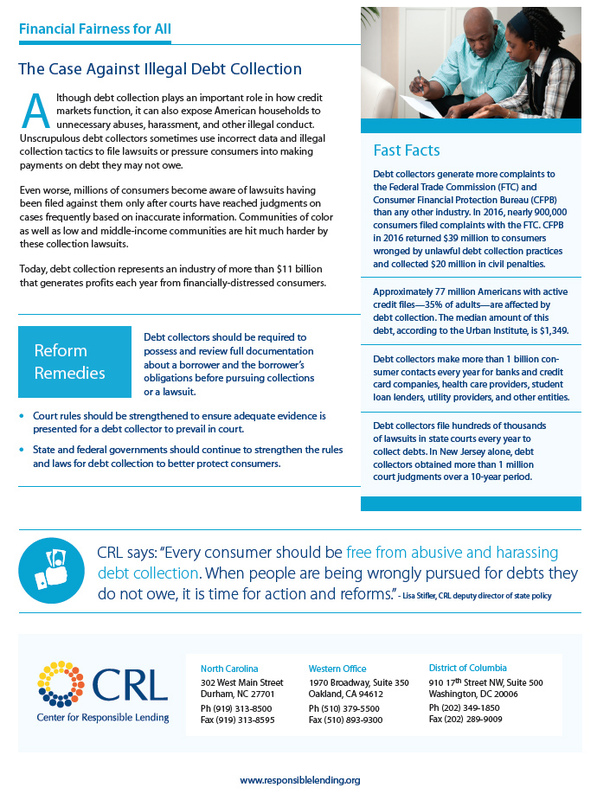 Download the debt collection factsheet.